This is probably the dish that brings me back to a specific time in my life more than any other. I used to be a very picky eater and my mom would basically make me anything I would ask for. Granted she would complain about how picky I was, but she would always give in and make me what I wanted. For a good 3 month time period all I wanted was Little Smokies! Of course I wanted to turn this dish keto, but I didn’t think it would be as tricky as it turned out to be. I was expecting this to be a naturally low carb dish but boy was I wrong. 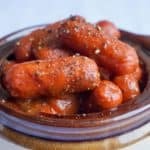 It took some time but eventually we came up with this little smokies recipe that is heavy on flavor but light on carbs. The original version of this recipe is loaded with carbs! Who would have thought? Sure the BBQ sauce contains it’s fair share, but even the innocent looking little smokies are packing some carbs. Most brands you’ll find will have almost a full 1g of carbs per piece. That really adds up when you sit down in front of the TV with a big bowl like I do. There are some brands that are close to 0 carb though. Be sure to look closely at the nutrition when selecting your little guys! We’re calling on our reliable low carb barbecue sauce to push this dish over the top. The sauce is the key component of this dish and will set a good batch of little smokies apart from an average little smokies recipe. This stuff is super simple to make, and if you don’t have every single ingredient it’s no big deal. You can taste it as you go to make sure you get it right. Try this little smokies recipe for your next holiday party! Makes Our Low Carb Barbecue Sauce. Add cocktail franks to the barbecue sauce and allow to simmer for 30-40 minutes with the lid on. Be sure to stir occasionally.